"Time heals all wounds" but also creates them. One of the positive aspects of going into therapy, rehab, or the like, is that you will pause ... and learn more about yourself than at any other time in your life as we are all about self-discovery. Most people care about what people think of them, sometimes desperate to be liked and accepted personally and/or professionally. When you worry about what other people think, you stop being who you really are and you start tailoring yourself to everybody else's expectations. Some people are just designed that way. 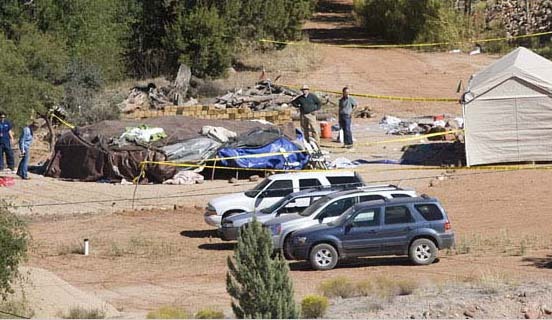 I've been asked to blog about the sweat lodge incident near Sedona, Arizona, after two people died and 19 others got sick at a New Age retreat organized by James Ray. I'm the last person you should ask about a sweat lodge, because I dislike feeling hot and sweaty as it makes me sick. Why would I want to feel that way? If that is the way to healing and higher consciousness - count me out. I refused to join a sweat lodge at the Star Knowledge Conference in South Dakota in 1996, when it seemed to be an honor for a woman to be invited. The next day friends reported feeling overcome by heat and were bitten by mosquitoes. 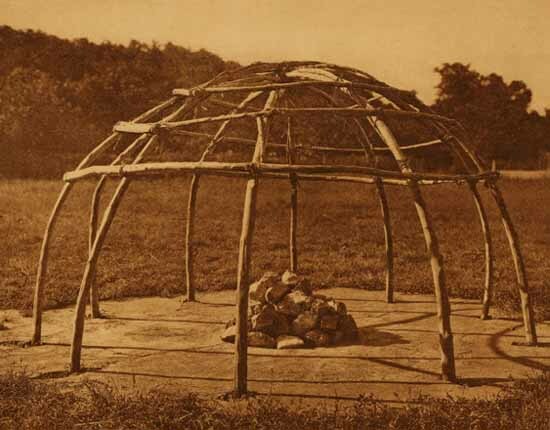 For all the positive stories I have heard about the sweat lodge, there have been as many negative ones. I have been told that the experience, induces visions, provides clarity, and detoxes the body, leaving one with a purified feeling. You don't have to suffer to reach that goal. 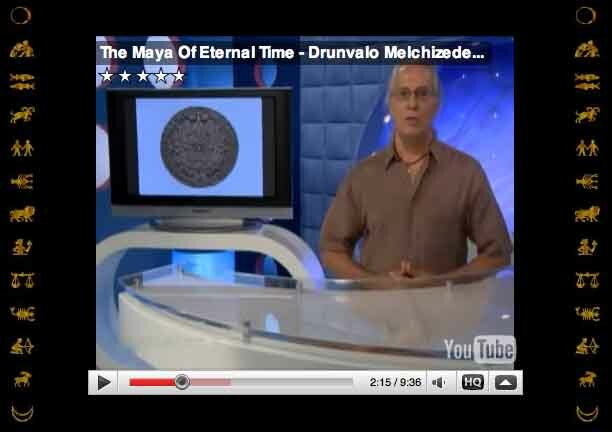 Guatemalan Mayan Indian elder Apolinario Chile Pixtun says archaeologists, astronomers and modern-day Mayas shrug off the popular frenzy over the date of 2012, predicting it will bring nothing more than a meteor shower of new-age 'consciousness,' pseudo-science and alarmist television specials. 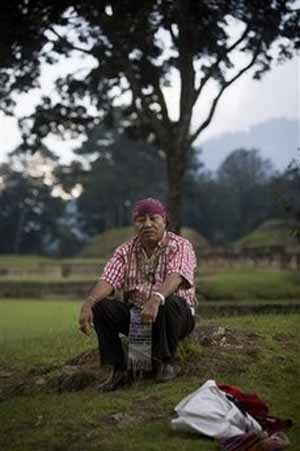 Chile Pixtun, a Guatemalan, says the doomsday theories spring from Western, not Mayan, ideas. A significant time period for the Maya does end on the date, and enthusiasts have found a series of astronomical alignments they say coincide in 2012, including one that happens roughly only once every 25,800 years. It may sound all too much like other doomsday scenarios of recent decades - the 1987 Harmonic Convergence, the Jupiter Effect or "Planet X." But this one has some grains of archaeological truth. One of them is Monument Six. Found at an obscure ruin in southern Mexico during highway construction in the 1960s, the stone tablet almost didn't survive; the site was largely paved over, and parts of the tablet were looted. It's unique in that the remaining parts contain the equivalent of the date 2012. The inscription describes something that is supposed to occur in 2012 involving Bolon Yokte, a mysterious Mayan god associated with both war and creation. However - shades of Indiana Jones - erosion and a crack in the stone make the end of the passage almost illegible. Archaeologist Guillermo Bernal of Mexico's National Autonomous University interprets the last eroded glyphs as maybe saying, "He will descend from the sky." The Maya civilization, which reached its height from the year 300 to 900, had a talent for astronomy. Its Long Count calendar begins in 3114 B.C., marking time in roughly 394-year periods known as Baktuns. 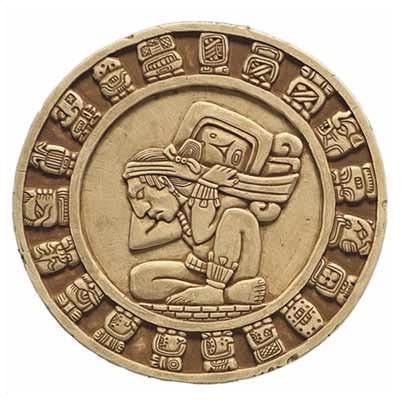 Thirteen was a significant, sacred number for the Maya, and the 13th Baktun ends around Dec. 21, 2012. 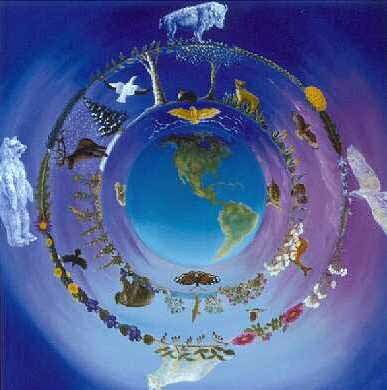 The hole where the Earth is joined with the sky according to the contemporary Maya of Yalcob‡, Yucat‡n. Traditional knowledge seems to have a knack for anticipating Space Age discoveries by centuries, sometimes millennia. This type of knowledge, shared by a larger populace and carefully handed down through generations, must be carefully distinguished from the private theories of individual thinkers. The precocious accuracy of the latter opinions must often be illusory and can be put down as a stroke of luck in the lottery of proto-scientific thought. Democritus (460-370 BCE) may have correctly predicted the existence of atoms, but Leucippus (480-420 BCE) was simply wrong in assuming that the earth is shaped like a drum. As far as popular traditional notions about the cosmos are concerned, however, the convergence with cutting-edge discoveries of modern science can often be quite unsettling, leaving us groping for ways to understand how they could have known. Scientists have known for some time that charged particles from the sun impinge directly onto the magnetic field of the earth through the activity of the solar wind. The magnetosphere of the earth is loaded with plasma, which occasionally erupts in auroral displays that can be enjoyed Ð or feared Ð at polar latitudes. The general concept is understood, but much of the detail of these complex processes remains to be discovered. For a few years now, it has been known that the transfer of plasma from the solar wind is not a permanent, steady process, but highly intermittent, dynamic, and 'bursty.' So-called flux transfer events, or FTEs, were thought to take place when the magnetic field of the sun points south and temporary holes in the fabric of the magnetosphere of the earth allow this to be loaded with plasma. In November 2008, space physicists announced evidence that such cracks arise when the solar magnetic field is directed to the north, contrary to the expectation. NASA's five THEMIS spacecraft discovered a breach in Earth's magnetic field ten times larger than anything previously thought to exist. Solar wind can flow in through the opening to 'load up' the magnetosphere for powerful geomagnetic storms." Analysts from the University of New Hampshire remarked that this opening was four times wider than the earth itself and more than seven earth diameters long, while the influx of particles was likewise 'an order of magnitude greater than what we thought was possible'. A computer simulation revealed that two holes frequently develop in the magnetic field of the earth, "...one at high latitude over the Northern hemisphere, and one at high latitude over the Southern hemisphere. The holes form over the daylight side of Earth, on the side of the magnetic shield facing the sun." It is believed that the openings form above the earthÕs equator and then roll over to EarthÕs winter pole, which is in the north in December and in the south in July. The holes close as rapidly as they open, NASA's current estimate being that the two fields of the sun and the earth "briefly merge or reconnect, forming a portal through which particles can flow" approximately every eight minutes. The perplexity expressed by scientists upon this discovery testifies that these colossal gaps in the geomagnetic field are also massive gaps in current knowledge. It is all the more puzzling, then, to find that traditional societies from different parts of the globe have long believed in "celestial portals" that open and shut at dangerous speeds. An earlier Picture of the Day concerned the widespread motif of an aperture in the fabric of the sky, that was often linked to the north pole Ð the "hole at the pole." Curiously, peoples on both hemispheres held that such sky holes open and close with great rapidity, not unlike the Symplegades of classical mythology. As part of their initiation rituals, prospective shamans of the Wiradjuri people, of southeast New South Wales, Australia, used to believe that they were led upwards by their spiritual guides to the celestial abode of the supreme god Baiame. From an anonymous medicine-man or doctor of the kangaroo totem of the Muri subclass of this nation, interviewed before 1887, comes the following account: "We went through the clouds, and on the other side was the sky. We went through the place where the doctors go through, and it kept opening and shutting very quickly." Just so, the Tsimshian, of northern British Columbia, observed prior to 1909 that the sky, a beautiful open country, is reached through the hole in the sky É, which opens and closes. A similar belief was subsumed in the esoteric tradition of Hinduism. According to this, the universe consists of three layers, the earth, the air or atmosphere, and the sky, that look like bricks with a perforation in the centre of each. 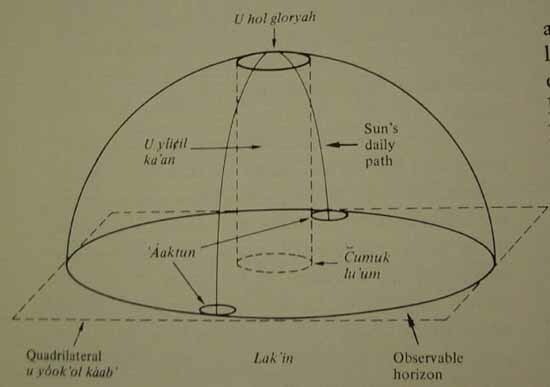 As the soul of the visionary ascends towards the sky, each of the three holes must be cleared to make way: "When the person goes away from this world, he comes to the wind. Then the wind makes room for him, like the hole of a carriage wheel, and through it he mounts higher." In this metaphysical brand of Hindu belief, the 'wind' behaves suspiciously like what is now called the solar wind. Were these traditional societies describing the holes through which flux transfer events take place? Certainly, it is hard to think of other phenomena in the natural world that could have inspired these traditions, attested in Australia, North America and Asia alike. 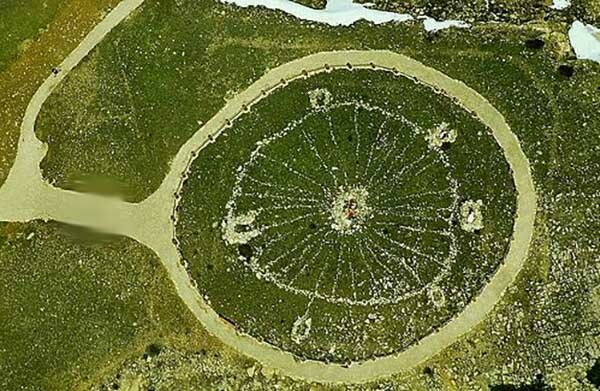 Can such holes ever be observed with the naked eye by human beings on earth? If it took scientists this long to discover their existence and even today the 'magnetic portals' have not been observed directly, is it not outrageous to suggest that pre-scientific cultures knew of them? It is impossible to tell at present. Perhaps electromagnetic activity in the inner solar system exceeded today's values by orders of magnitude in order for flux transfer events to become part of the experiential horizon of humanity. Perhaps shaman have at times been able to condition their minds in ways that enabled a direct experience of events transpiring in the ionosphere. All of this remains highly speculative for now, but the fuel of scientific discovery is to ask provocative questions. It is certainly hoped that flux transfer events will earn a prominent place in the agenda of 'plasma-mythological' research.